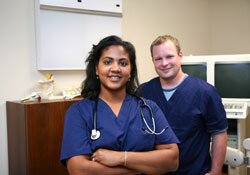 To provide healthy living in Western North Carolina, this hospital offers many different services. There are many physicians from all areas of specialty. There are highly qualified doctors who practice the latest developments in medicine. Haywood Regional Medical Center also has an award winning health and fitness center that further promotes a healthy lifestyle for its residents. This Waynesville, NC hospital also has many centers of excellence providing the best in healthcare for each individual patient. From emergency care, advanced home care to cardiac and spine care services, Haywood Regional Medical Center is a full service hospital with every type of doctor that may be needed.